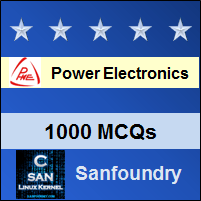 This set of Power Electronics Multiple Choice Questions & Answers (MCQs) focuses on “MOSFETs-1”. Explanation: It is an enhancement of the FET devices (field effect) using MOS technology. 2. Which of the following terminals does not belong to the MOSFET? Explanation: MOSFET is a three terminal device D, G & S.
Explanation: It is a voltage controlled device. Explanation: MOSFET requires gate signals with lower amplitude as compared to BJTs & has lower switching losses. Explanation: MOSFET is a three terminal device, Gate, source & drain. It is voltage controlled unlike the BJT & only electron current flows. Explanation: The arrow is to indicate the direction of electrons (opposite to the direction of conventional current flow). Explanation: The gate to source voltage is the controlling parameter in a MOSFET. Explanation: Examine the internal structure of a MOSFET, notice the n-p-n structure between the drain & source. A p-channel MOSFET will have a p-n-p structure. Explanation: It is the minimum voltage to induce a n-channel/p-channel which will allow the device to conduct electrically through its length. Explanation: It is Id vs Vds which are plotted for different values of Vgs (gate to source voltage).